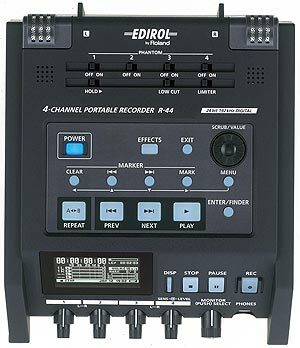 The Roland R-44E is based on Roland/Edirol's popular and well respected R4 portable hard disk recorder, but being an SD Card recorder it comes in an even more conveniently sized package. 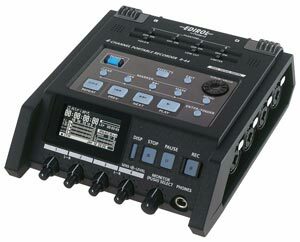 With an R-44 you can capture up to 4 channels of uncompressed audio with selectable bit depths (16-bit or 24-bit) and sampling frequencies (44.1kHz/48kHz/88.2kHz/96kHz) onto SD or large capacity SDHC card media. No moving parts enables the most silent and reliable operation possible, and because it has 4 input channels you are not going to need an external mixer for most of your recording assignments. Although the R-44E is compact, all the necessary functions are included. Built-in high quality microphones and speakers make recording and monitoring without external devices possible. An on-board limiter helps suppress sudden peaks in sound from an input source. A low-cut filter is included to help prevent things like wind noise or mic handling noise. Internal studio class effects such as 3-Band EQ, 6-Band Graphic EQ, Enhancer or DeEsser can be used as tools to greatly improve audio quality. Effects can be applied while recording or simply for monitoring/playback. This ensures you never miss that important moment again The Pre-Record function buffers input signals so when the REC button is pressed, the material from the previous few seconds (selectable) is included. This also helps reduce sound bites at the beginning of a recording by not having to start the recorder too early. These enable connection with a variety of devices. The combo input jacks (4) supports the connection of both XLR and 1/4 inch plugs. 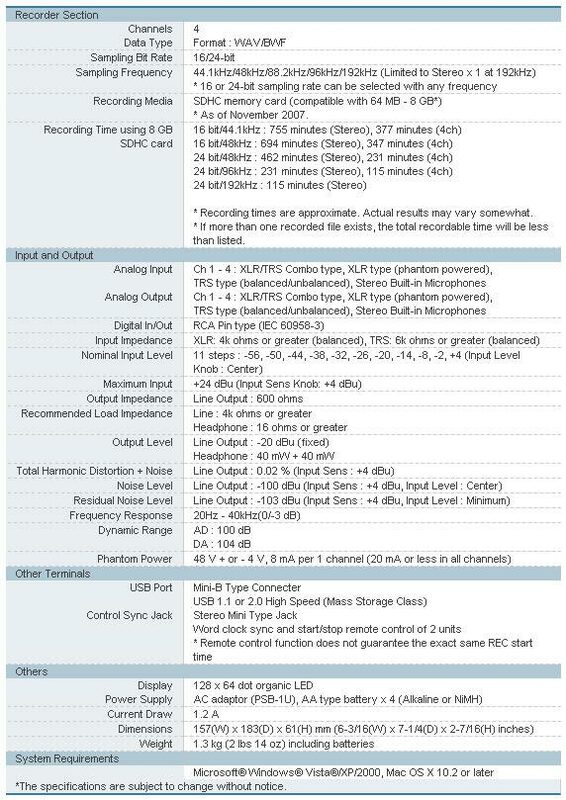 XLR inputs are equipped with phantom power. 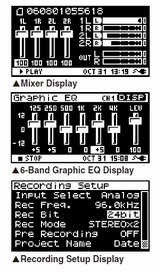 Eleven steps of input sensitivity enable the connection of various devices with a variety of inputs levels from microphones to musical instruments. High quality analogue circuitry in the preamp ensures superior recording results. The Control Sync terminal enables synchronized operation of two R-44 units. You can control the second unit from the master by simply connecting them with a stereo mini-jack cable. The master unit can remotely control REC standby, REC start and REC stop of the slave unit. This function enables 8-channel recording in a compact space and at an affordable price. The R-44E can be mounted to computers with a simple USB 2.0 connection. It is seen as an USB storage device on your computer. You can copy data back and forth with a simple drag & drop operation. The R-44E can be operated with 3 types of power supply: AC adaptor, external battery or AA batteries. Four hours* of operation is possible with NiMH or alkaline batteries.